Dietary linoleic acid elevates the endocannabinoids 2-AG and anandamide and promotes weight gain in mice fed a low fat diet. Raphi sent me this link early in the New Year. It’s nice. It demonstrates, at some level of complexity, that omega 6 PUFA at 8% of calories are obesogenic in mice, even if they are fed otherwise fat free CIAB. It’s all about endocannabinoid ligands and receptor activation. Potentially useful when folks get round to starting class actions against the cardiological community and any other health advisors warning against saturated fat. If you limit fat to 30% of calories and saturated fat to 10% you still have 20% PUFA/MUFA in your diet. That’s easily obesogenic. Your cardiologist made you fat. Sue now. But all of this endocannabinoid stuff is what I call high level signalling. At the core mitochondrial level we know that omega 6 PUFA fail to limit insulin activity under situations where a saturated fat would shut down insulin mediated calorie ingress. In an adipocyte this means that, during oxidation of omega 6 PUFA, insulin continues to signal and fatty acids (and glucose) fall in to the adipocytes, stay there, and you get really hungry. Modified chemicals derived from this system of omega six fatty acids are overlaid on top of the core mitochondrial signalling. A modified derivative of arachidonic acid becomes an endocannabinoid ligand and makes you hungry and fat. The system takes something basic and develops an overlay of enormous complexity, this is what I call higher level signalling. I hate higher level signalling. Give me the core process anyday. Sucrose counteracts the anti-inflammatory effect of fish oil in adipose tissue and increases obesity development in mice. 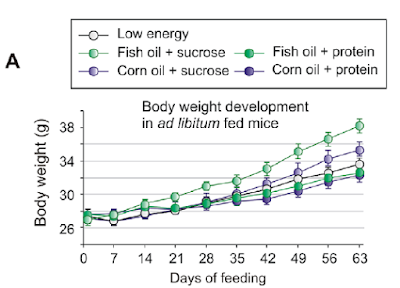 Notice the obesogenic effect of fish oil only shows when sucrose is present in the diet. Replacing sucrose with protein eliminates the effect. Fructose is an unstoppable source of cellular energy intake which needs insulin resistance to limit insulin signalling facilitated ingress of glucose. As insulin continues to act, fat cells sequester calories. Fish oil combined with sucrose is the worst, corn oil is intermediate and, without sucrose, none of the fats are obesogenic. This makes me happy. I can see the core process at work, never mind what EPA and DHA say to g-protein coupled receptors. Adipose tissue inflammation induced by high-fat diet in obese diabetic mice is prevented by n-3 polyunsaturated fatty acids. The values to look at begin with the weight gain. All we have to do is to subtract weight at the start of the study period from weight at the end (perhaps the authors don't do arithmetic?). Low fat group gained a gram, added saturated fat group gained 0.6 g, added omega 6 group lost* 2.4g and omega 3 group gained 10.4g. These are db/db mice which lack a functional leptin receptor. They are diabetic and I feel their chronic hyperglycaemia represents a similar drive to obesity as the fructose loading in the last study, ie an unregulated source of calories which drop in to adipocytes and which require insulin resistance to shut down whatever further caloric ingress it can practically do. 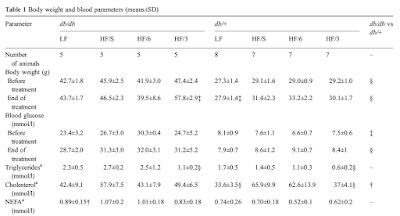 Free fatty acids, a reasonable surrogate for the action of unmeasured insulin, are low so this suggests adipocyte sensitivity to insulin is high, hence the weight gain. 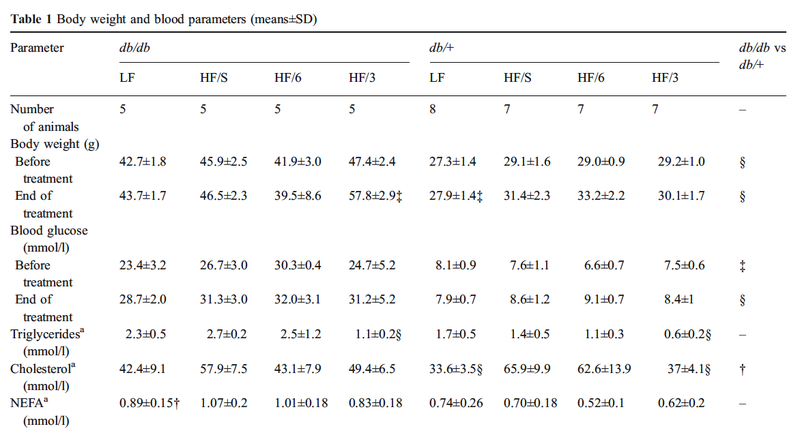 "Body weight at the end of the study was somewhat higher in db/db mice fed HF/3 compared with HF/S (Table 1)". There is no other mention of the hard fact that omega 3 fats are obesogenic. Also note that in relatively normal, non hyperglycaemic db/+ mice, the omega 3s are not obesogenic. Much the same as for non-fructose fed mice in the previous study. Now look at the * I put in above. The omega 6 diabetic group LOST 2.4g. Ouch, at the core mitochondrial function level! How can this be? This needs no mention at all in the paper because p is greater than 0.05 (in the twisted stats used by the authors). But brownie points if you have noted the oddity about this particular group of mice. So, I went to an on-line standard deviation calculator and fed in various options where 4 mice gained some weight and one mouse lost a tonne of weight. Using a 2g gain for 4 possibly healthy mice and a 20g loss for the fifth poorly mouse we get four mice at 44g and one at 22g. This gives a mean weight at the end of the study of 39.5g to with an SD of just over 9. I think something like this is what happened. Would this group notice one skinny mouse in with four fat ones? Hahahahaha! Summary: When PUFA are being oxidised in the mitochondria of adipocytes, those adipocytes are unable to resist the signal from insulin to distend with fat. The more double bonds in the PUFA has, the greater the effect. Linseed oil should be used for making varnish. I hear PUFAs are also good for finishing iron frying pans. I prefer to use bacon grease, due to the oxidized by-products of PUFAs. And I throw out bacon grease that's not solid at room temp. "Soybean Oil Is More Obesogenic and Diabetogenic than Coconut Oil and Fructose in Mouse: Potential Role for the Liver"
The soybean-fed mice all got fatty liver, also. Fatty liver is pretty clearly caused by excess n-6 PUFA consumption, in mice, rats, and humans. Replacing linoleate with fish oil cures it, oddly enough. In humans. So what happens to people with fatty liver if you put them on a low-PUFA (4% energy—relatively low), high-carb (55-60% E) diet? "Following the six-month dietary intervention, hepatic steatosis resolved completely in all patients." Kind of a poor study, as they give no information about the prior diets of the subjects, but a 100% cure rate ain't bad. Fatty liver was highly correlated with the presence of n-6 metabolites, which were reduced after the intervention. Which again, ain't shocking, as others have shown n-6 metabolites are clearly correlated with dietary linoleic acid intake. I found some of this when trying to figure out why Mozaffarian says linoleic acid is good for fatty liver in his latest Circulation paper. Nothing's more dangerous than the combination of a cardiologist and an epidemiologist! Keep up the good work, Peter! I have made many pints of cooked varnish from linseed oil and low oleic safflower they oxidize nicely and polymerize to a fine gloss. That studies have shown the difference between oxidized omega6 and non oxidized fully functional omega6 ? No question these fats are easily oxidised! This is a complex subject. The metabolic and wider effects of linoleic and linolenic acid and their oxidised products are many, including those examined by Blask as highlighted by Peter. Omega 6 was a staple for the hunter gather Kung!but they were not obese, however they did not eat highly processed vegetable oils and their downstream products in processed foods, had different lifestyles etc. There are a number of papers that support Omega 6 being an obesogenic factor, via a number of pathways. Omega 3s are generally rapidly metabolised, and associated with moderating obesengic trends. The longer Omega 3s DHA particularly are metabolised by the peroxisomes. Downstream oxidised Omega 3s have in general very different biological roles to downstream oxidised Omega 6s. The effect of Omega 3 on the db- mice above could hint at why they are obesity prone; do they have 'defective' peroxisomal or related upstream or downstream pathways, and so fail to efficiently peroxisomaly metabolise fats at time of energy surplus? Long chain Omega 3s eg DHA (22 carbons) cannot be metabolised by the mitochondria so if not metabolised by the peroxisomes must be directed to storage. This might explain why Omega 6s were in this instance less obesogenic than the Omega 3s. Ideally we should get the Omega 3s we need in whole foods, but omega 3s are much reduced in the industrialised food chain. For those with low linolenic acid intake is there a net benifit in modest supplementation with cold pressed flax oil or flax seed; probably; the reasons are complex and multifactoral, but include helping to address Omega 3:6 imbalances, which brings us back to Peter's point that industrially refined oils high in polyunsaturated fats and often very rich in Omega 6, which are factors in Omega 3:6 imbalances, are best avoided in the first place. Polyunsaturates may bind with iodine so reducing availability for the thyroid. There is limited evidence for this; it was observed by Sir Robert McCarrison many years ago in pigeons and is debated; iodide / iodine are transported by other mechanism as well as thyroxin, and iodine appears to be stored in fatty tissue; in fatty tissue is it stored loosely attached rather than bonded to polyunsaturates? You may find this thread thought provoking. I am RB. The https://www.jax.org/strain/000664 C57BL/6J mice are also prone to obesity. Linoleic acid for Varnish? I thought it was for making linoleum. Actually, it is amazing what all it can do - increased cancer, CAD, inflammation, flooring, bio-diesel, .... Hey anyone think concentrates of linoleic might not really be fit for human food? The idea that the government is still promoting it is surreal. Consumption continues to rise - and it is even increasing in the meat of livestock. ^ Linseed oil, a mix of linolenic and linoleic, is used to oil cricket bats, and is a constituent in traditional paint glazes; it is sometimes used raw and sometimes boiled. It is also a binding agent in natural glazing putty. Wondering- get LDL fractionated? Why is HDL going down? Nuts? Too much meat? G'day R Cobb - I believe the Hyperlipid view of HDL is that it is a surrogate for how much SFA you're consuming - so perhaps yours has reduced if calories were roughly constant. As for getting LDL broken down - I s'pose it depends on whether the results will lead to changes in your behaviour. If it's cheap for you, I guess it might be interesting. At such low levels, I can't see there being much of the the cold and bitter type. CBLDL is nasty stuff. Re linseed oil - Python knew it was nasty stuff as Cleese in the Meaning of Life noted that "two boys have been found rubbing linseed oil into the school cormorant. Now some of you may feel that the cormorant does not play an important part in the life of the school, but I would remind you that it was presented to us by the corporation of the Town of Sudbury to commemorate Empire Day, when we try to remember the names of all those from the Sudbury area who so gallantly gave their lives to keep China British." Interesting article from a controversial author on fish oil. There are some supporting papers to this article in the reference list. R Cobb and Spittin', Yup, as far as I can see HDL = sat fat intake, haven't looked at MCTs but I suspect their ketone derivatives might raise it too. Thanks Peter and erdoke!- yeah the minute your cholesterol goes one over 200 you're in the red- Ravnskov is great! There are over 100 different forms of HDL - some are thought to cause arteriosclerosis - they pulled a drug that increased HDL when people started dying. That lab number is worthless. Seems people must think that we evolved LDL to cause heart disease. The best take on this I've seen has to do with what our body does with dying bacteria - when the body see these, it recruits monocytes that become macrophages to engulf them. The bodies defense against bacteria is to spit a bit of nasty oxidizing bit on their cell walls punching a hole and leaving oxidized cell wall lipids behind. It is these oxidized bits that the immune system detects with the macrophages. Now if you have oxLDL instead, these macrophages get confused and engulf them as well. Pack enough oxLDL into a macrophage in an artery wall and you get what is called a foam cell. What increases oxLDL? Try Linoleic acid and other PUFAs - eating PUFAs will lower LDL a tiny bit but ups oxLDL and makes people get fat. high BG, carbs also glycate lipids making them more prone to oxidation. Lipoprotiens were not evolved to provide income to cardiologists. They transport lipids and are part of the innate immune system. I don't believe that statins do their little bit of net good by lowering LDL - Statins modulate the inflammatory response a bit(I think of the lowering of LDL as a side effect) . There are other cholesterol lowering drugs - yet they don't seem to do any thing other than treating a lab number. End points matter - all cause mortality seems important to me - a lot more important than a lab number. Then there is quality of life - seems not to enter the equation to the medical community - I found it rather important to me. Why is getting people to obsess over meaningless lab numbers - causing guilt trips, stress etc considered good medicine? Look all food is technically bad for you - if you want to live the longest - semi-starve yourself constantly. You will suffer - your brain won't work so well, probably feel depressed - but you will live longer. I have no interest in that. I want to live well. That is not living. I mean you can prevent oxidizing damage if you stop breathing - is that a good idea? What I do, is avoid foods made with sugar, excess carbs, or veg-oils - like fake cheese(burger joints), salad dressing, restaurant food, fake sour cream - fake butter. I try to get grass fed meat when I can - I eat nuts when I feel like it (I want to eat a little bit of PUFA). Why not live life to enjoy it? OK - I come from a family of MDs - my father - 2 uncles, my cousin and his wife. I loved Biology and read too much - had the good sense to stay out of medicine for a career - But I have a pretty good idea what the reality of medicine is. I think that modern medicine is not what it pretends to be - they are good at sewing up cuts, setting bones, unplugging tubes, removing growths - but when it comes to internal medical chemistry, there is a lot of hand-waving - testing for things that they have no treatment for or treatments that might as likely be doing more harm than good. That being said - the one thing we know is that high BG is bad - and for decades they didn't test postprandial BG - only now with the A1C is there a clue. The standard treatment numbers seem wrong to me(average is not healthy). High BG is easily treated with minor dietary changes for the most part. There is no money in teaching people to eat correctly anyway. There is profit in selling tests, pills, and doing operations. They sell you tests that have dubious interventions with poorly defined risks. For the vast majority of people - that quote: "the best cholesterol level is one which hasn't been measured" rings true to me. Here is the question - is the weak correlation with LDL and CAD due to LDL - or is that there is more LDL that can become oxLDL? I have not seen a study that holds oxLDL constant to see if LDL really is an independent risk factor that matters. Do they want to look at this too closely - they found that statins don't lower oxLDL - and for some reason no one tests for oxLDL levels. (I wonder if the $Bs at stake are why?). The new bit that I think I've learned is that a diet high in PUFAs - particularly Linoleic acid sounds a really bad idea. No one ate purified veg oils until the 1920s. Not hard to eat MUCH less PUFA than the average public that is eating 5X what they ate in 1960. People eat a lot of CIAB - carbs coated with PUFA or sugar. I just don't buy that stuff. My quest has been to understand what is causing the obesity pandemic - excess PUFA consumption is at the top of the list. - via beta-cell damage or mDNA or what?? Anyone that thinks they know for sure obviously does not understand the question. yeah Karl, I hear ya, I eat pretty much only grass fed meats, ghee, tallow, lard, MCT's and coconut, olive oil ran out and haven't replaced it- trying to cut down on the nuts tho, eat heavy cream, eggs what not, low veg bc my gut just doesn't like em, I feel best honestly with a big pile of beef n fat! somethings working there... thx for the info- I appreciate your time! Something else I have remembered from my varnish making days, various metals and salts are added as traces to catalyse the reactions, calcium being one of the most effective. You might say that's an in-vitro experiment really more in-bucket, but goodness knows what happens to the stuff in-vivo! Cooking up oil varnishes at high temps has left me with a lifelong aversion to the smell of linseed especially the stuff they use for deep frying in some takeaway shops. What would you want to eat that stuff, tastes like floor polish. What are your thoughts about the Technion study showing highly individualized responses to seemingly low carb food, where some people produce excess insulin and have high blood sugar from innocuous foods like chicken breast? Do you have a link for the Technicon study? Dayum. I was really enjoying the linseed, parmesan and rosemary biscuits, too.